well, it's very hot in Kuala lumpur for the past 4 months, and it's in peak from march. So, we've to keep drinking something cool to keep ourselves hydrated. This drink was prepared last month and clicked in a jiffy as it was started melting the moment it was out of the fridge. So it was mere a straight shoot , with nothing around. I hope u like them..
Take a tall glass and add 2 tbsp of mango puree as the first layer. Then add the soaked basil seeds as the second layer. Now pour in a tbsp of condensed milk and a tbsp of milk as the next layer. Next, add in the chopped jello as the next layer. Then layer the falooda sev/ vermicelli as the next layer and top it with a tbsp of condensed milk and the remaining milk. Next add in the nuts as the following layer. Drizzle little bit of condensed milk on top. 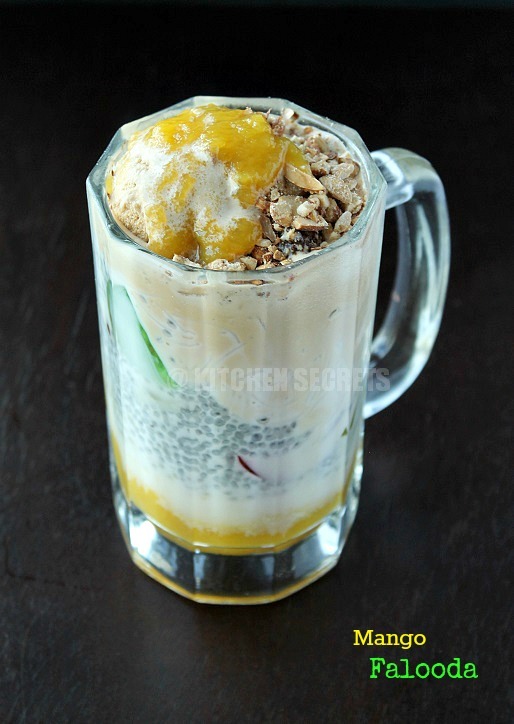 Now top the glass with the ice cream, sprinkle the remaining nuts and the remaining mango puree on top and serve cool with a large ice spoon. U may change the layers as per ur taste and keep it refrigerated until it's served. I've just made one, which is way more than enough for a person and I's completely filled. Use semiya/vermicelli if u don't get corn flour vermicelli /falooda sev. It's better to cook the vermicelli until it's 70% cooked and take off from the heat. It will eventually cook even more in the remaining time. Don't make it mushy. Here, I've used freshly made mango puree and so the texture is bit different. 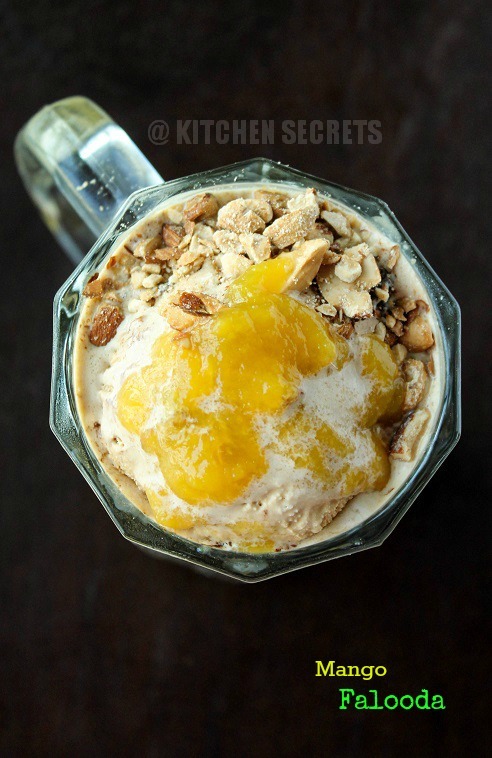 Also I've used almond ice cream, better use vanilla ice cream if u have it. Yummy and delicious looking falooda. Awesome looking falooda. Wonderfully prepared. falooda looks yummy. I love it anytime. 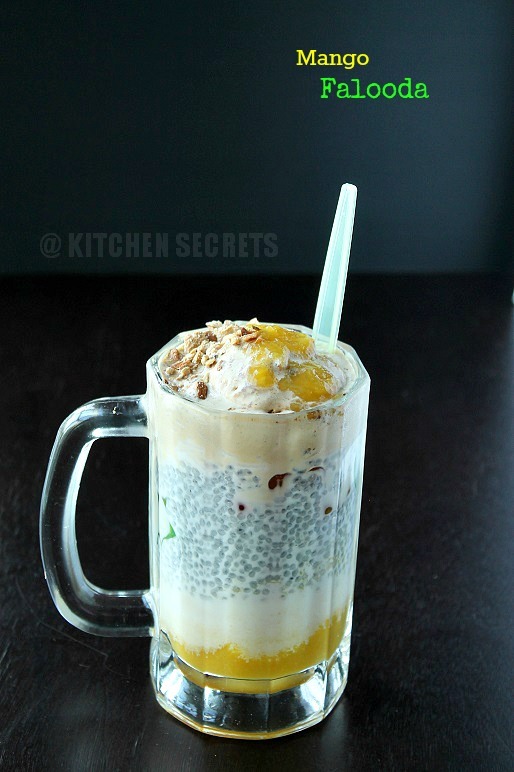 Drooling here, i want that irresistible mango falooda, prefect for the season. 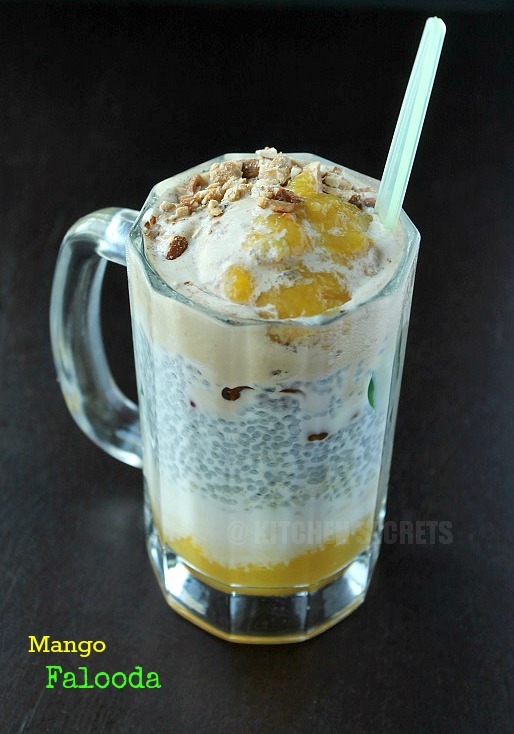 Very much refreshing falooda for this summer.nice colour of basil seeds.